Slemish is remarkable for its pudding-like shape, which makes it unmistakable from any angle. It is particulary prominent seen from the west near Ballymena. This shape is due to its origin as a volcanic plug. According to tradition, it was on Slemish that St. Patrick spent six bleak years as a slave herding sheep and swine. Patrick was captured in Britain at the age of 16 and sold as a slave to an Irish chief named Milchú. 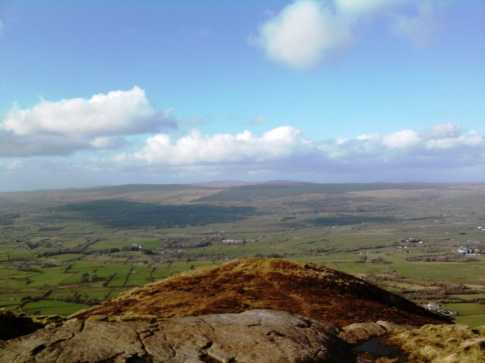 Slemish is the 776th highest place in Ireland. A bright, dry and clear afternoon in late March - perfect weather I felt to revisit an old friend, although I hadn't climbed it in about 8 years. I deliberately waited until the week after St Patrick's day to enjoy Slemish in its full glory. I was glad to see when I reached the car park there were no other cars there so I had the mountain to myself. Sadly there were a few remnants from the previous week's visitors littering the route - I saw 1 beer can and 2 water bottles which I removed from the mountainside. I climbed the slightly more difficult NW slope. The going was good, the recent dry weather helping conditions underfoot. The ascent was pretty straightforward, though perhaps a little steeper than I remember. The summit can't be seen on the approach and is reached rather suddenly - the first thing you notice is the wind picks up even more than normal, then the steep slope quickly opens out onto the summit area. I can confirm that there was once a trig pillar on the summit - nowadays a large wooden cross marks the point. Views? You bet! Although Slemish is only 437m high, its relative isolation from other hills means there are extensive views over the Braid valley and the higher Antrim hills to the north (Slievenanee and Trostan in particular clearly visible), then east to to the North Channel, Agnew's Hill and the Belfast hills to the south and Lough Neagh and the Sperrins to the west. I didn't stay long on the summit - the wind was biting hard so I quickly descended by the slightly easier SW slope.